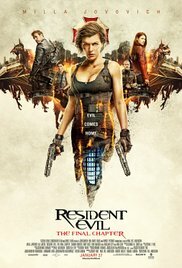 In the sixth and final installment of the Resident Evil franchise, Milla Jovovich plays Alice one last time. The franchise has been ongoing since 2002 and this film helps it to go out with a bang. The flick takes us back to where it all started, Raccoon City. Alice has fought people infected with the T virus for many years, but now she has the chance to end all the bloodshed by releasing a cure that she is not sure will work. We finally get everything answered about the origin of the T virus and also get some secret background information on Alice. Trust me I was blown away as all the pieces came together. Overall, the film seemed a little sped up on some scenes, but if you have seen all the past films like I have it probably won't bother you. It was a change because some of the older installments seemed to drag out the story and were almost unbearable. But this closed everything off perfectly in my opinion and there shouldn't be any reason to continue the franchise, and I'm hoping they don't. The action was great and the story that sealed the deal was no less than perfect. I walked out with no questions and a smile on my face and I believe all the fans out there will do the same.